system, which are stacked in the construction of the tower. Different origins and profiles are put forward. Self-owned housing and large scales are considered regarding the design process. The short-period residents such as exchange student, young users are tackled in the work. It is an interesting group due to the new demands of Lisbon. Different modules for different functions including vertical usages have provided professional attitudes towards the intervention. Attempts for sun protection and climate are also a part of the vertical/horizontal design formulations. The solutions are presented in good quality graphical senses. 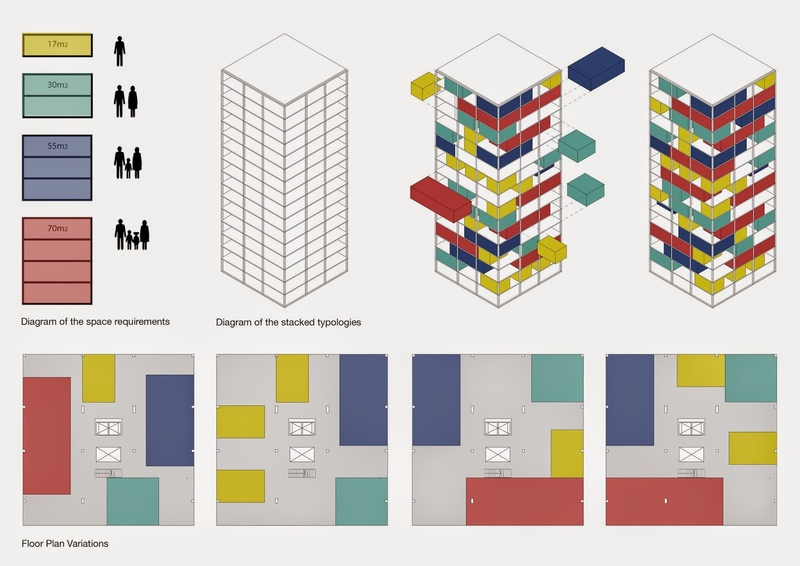 For the future fragmented spaces within the floor plans can be integrated with respect to the other input in the in-situ.